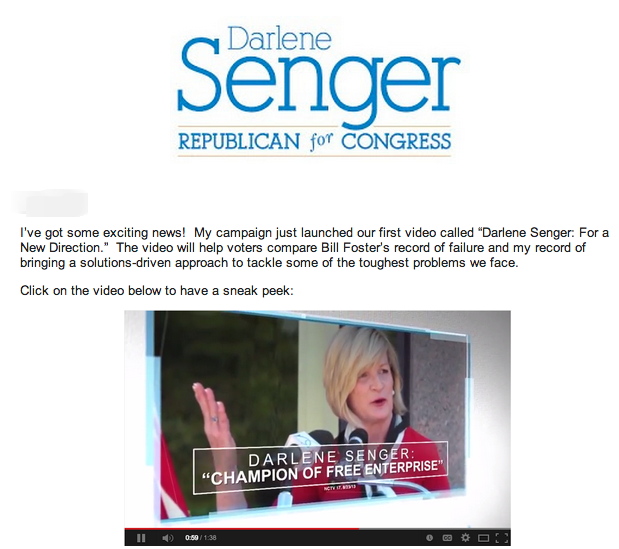 In an email blast, Congressional Candidate Darlene Senger told her supporters about the debut of her new web video that contrasts her opponent Bill Foster with her record and goals in Washington. My campaign is going to work tirelessly till the election to help get my message of lower taxes, smaller government and more opportunity to voters within the district. And with your help, after the election I will be working to make those ideas a reality. Can I count on you today for a contribution of $50 so that 1,000 more people can see our new video?